So here we are then, in the middle of a somewhat warm and very wet winter. Which is reminiscent of the somewhat warm and very wet summer we had last year. Our climate is becoming almost predictably monotonous. The only high spot in the whole winter affair this year has been Christmas. usually I don’t make any declaration as to what I may or may not wish for myself for Christmas in the line of presents, being more than prepared to allow myself to be surprised by my nearest and dearest. However, on reflection, that seemed a bit selfish as it forces said nearest and dearest to go out into the pulsing local society and hunt for possible gifts in the shops. I know that can be exhausting and I dislike the process thoroughly myself as I am not what one would call an accomplished shopper. This year then, things had to change. I actually put some thought into it. What would I really like and appreciate? Big question. It was surprisingly easy to answer though. One frost free and clear evening I was again outside on the patio doing something probably extremely important and apparently easily forgotten, when I looked up and saw the night sky in all it’s glory. I’ve always been fascinated by the sky at night. I’ve had to navigate by it, I know a few of the constellations well and can name a few stars and planets and am always impressed when I spot the odd shooting star or other such celestial events. Seeing Orion so clearly represented in the south-eastern sky I decided I’d like to see it up close and personal, so to speak. I’ve used binoculars before but 10 x magnification is not exactly revealing. Nope, I need a telescope that can really do it for me. 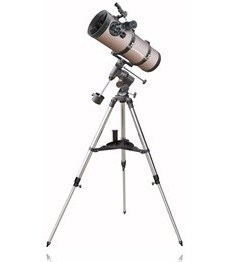 I went off to my computer, Googled around for a while and then found an affordable but not exactly cheap Newtonian scope. That’s the one with a mirror at the bottom of a tube and an eyepiece at right angles to the scope. I left the picture on the screen and told my good lady to take a look if she was interested. She did. I said no more. Christmas day comes and so did my telescope…. Surprise, surprise. It’s a beauty. Not to mention the size of the thing. Once assembled, it is quite impressive. The assembling of the telescope, by the way, was done with a total lack of assembly instructions. There simply aren’t any included. Luckily, most of it was pre-fitted and one can “feel” ones way forward. I had to try it out of course and did so on the first clear night after Christmas. Wow! I lined the scope up with the pole star, as is recommended for calibration, and then fixed my beady eye on Jupiter. And all its moons. And other stuff you just can’t see with the naked eye. Despite the light pollution, I can see a whole lot more now than I could with the binoculars. I spent a couple of hours tracking our largest planet and following the movement of the moons around it. I would have stayed longer, but I got cold and decided that was enough for one night. The really good thing that came with this, is the computer software that gives a good view of the night sky as it appears in real time from any chosen location on Earth. Which makes for better and easier navigation when observing. It also gives the names of all the objects out there and where to find them. I know this is going to develop into another great hobby.